We have many more beer drinkers than wine drinkers at our Star Wars parties. Yet we have always only had regular, “boring”, non-Star Wars beer. Well, thanks to a post by Red 5 Mom and a few of our friends, this year, we finally had beer fit for a Star Wars Cantina. Red 5 Mom (GREAT blog name!) 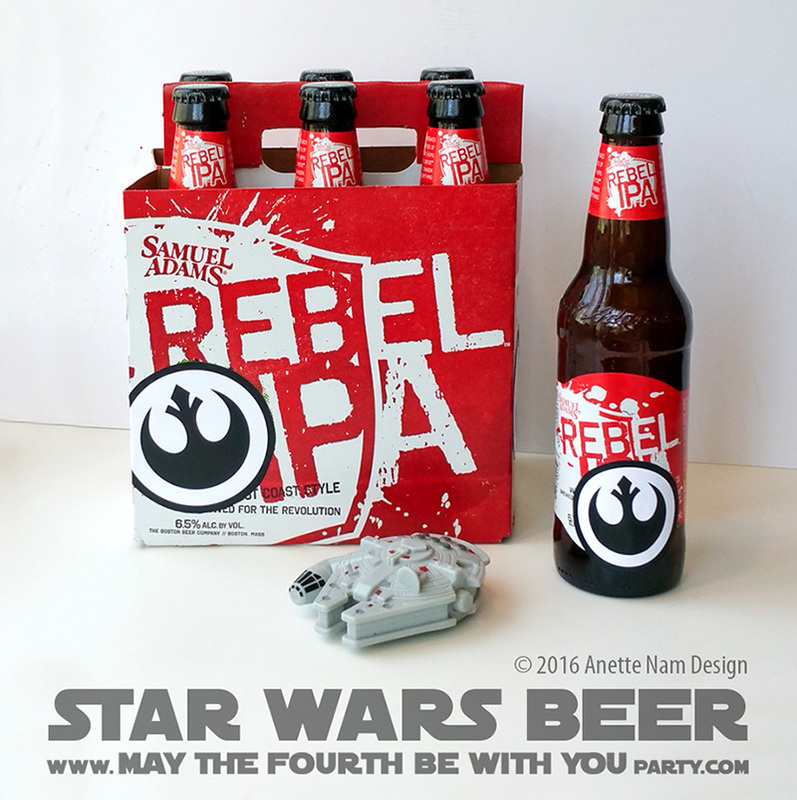 shared her ideas for her May the Fourth Party, and she used Samuel Adams Rebel Rouser IPA as the adult beverage of choice. BRILLIANT! So I went to a local grocery store (with the largest beer selection around), and though they didn’t have Rebel Rouser, they did have Rebel IPA. I bought a few 6-packs, and made Rebel insignia graphics to cover up the big hops on the case and the bottle labels. (You can download the “Patch” [with sized graphics], from the bottom of this post). “Space Rock” by Short’s Brewing Company is of course very thematic. Now, this post would not complete if I did not mention the piece-the-resistance: Kereru Imperial AT-AT Pilsner. It is not available in the US, so we did not serve this, but rather I found this beauty on the The Hitchhiker’s Guide to Beer. From what I can tell from Kereru’s website, it is only available in Australian and New Zeeland, but there is a “coming soon” under US availability. WOO-HOO! Photo from the Hitchhiker’s Guide to Beer. Check their post out for a detailed review of this pilsner. Disclaimer: I am not reviewing the quality of the beers here… I do not know enough about beer to even pretend to do such a thing. These recommendations are based purely on their intergalactic appropriateness. Note: As always, you may download our “downloads” for your personal use, but you may not use to sell or use for any professional services/projects. We would love for you to link to our downloads, but you may not download and then upload and offer as downloads on your own site. Also, please include “Labels © Anette Nam Design” and maythefourthbewithyouparty.com if you share, post or publish your photos of our designs anywhere… and please let us know when you do, ‘cuz we love to see how our work is being used! THANKS! Download and print out Rebel Icon Graphics. Cut out. If you have one, use an X-acto and ruler instead of scissors, it looks much cleaner. If you have the time, going over the edges with a black marker makes it less obvious that the Rebel icons are pasted on. Normally I stay away from spray mount on anything involving food, but with glass bottles I think it is OK. Or you can also use double-stick tape. Or of course, you can always print on full-sheet labels . Download Rebel IPA Beer Patch jpeg below.